Grips: 2" to 3-1/8" Expands: 2-5/8" to 4-3/8"
This Chuck requires an Adaptor to fit your lathe's spindle size. The Adaptor is purchased separately (item #118151A-P shown below). 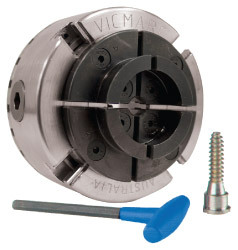 The VM120 Vicmarc 4-jaw self centering chuck measures 5" in diameter and weighs over 8 lbs. This chuck will handle large or small workpieces. The jaws supplied with the VM120 will grip a spigot from 1-7/8" to 3-3/4" in diameter and will expand into a dovetail recess from 2-5/8" to 4-1/2" in diameter. This 5" diameter chuck has a closed body to keep out dust for continued smooth action and single hand tightening that make it a pleasure to use.